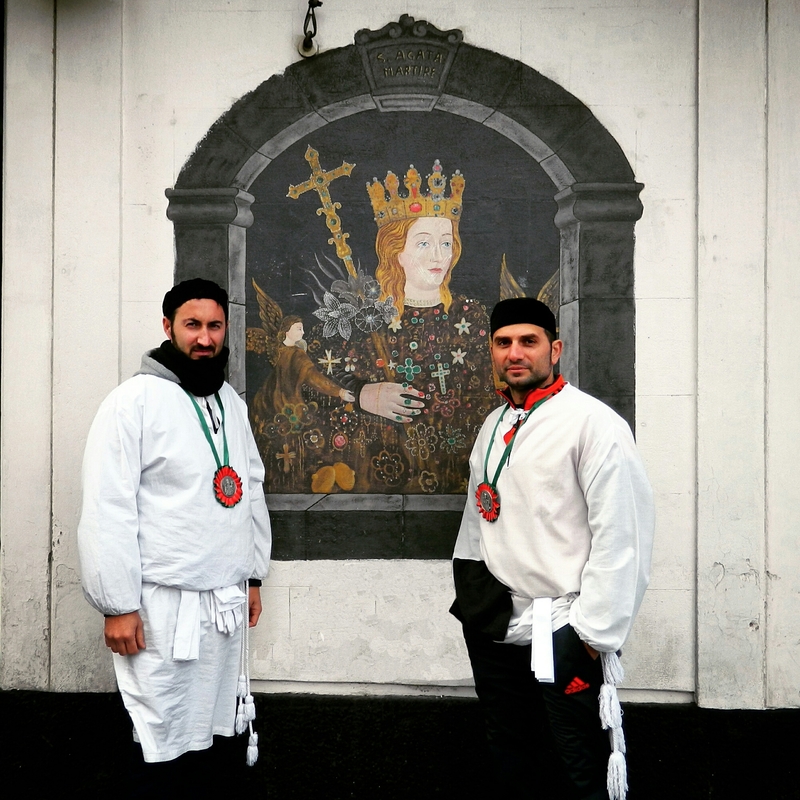 My takeaway from the Festa di Sant’Agata in Catania last year was that there was a pure sense of fraternity, community, and hope among the “cittadini.” The faith that followers have for their patroness was so inspirational. And their faith in each other was as well. Taking a long view (and a New Yorker’s view), the city’s streets and major piazzas are jammed with people. Jammed. The fireworks each night are magnetic–people come in droves to witness them. And they also come to light candles as an act of prayer for the saint. Now, individually, the four-foot-long candles are one thing, but on the night between the 4th and 5th, devotees also carry bundles of them over their shoulders through the streets–essentially carrying fire. Need I say that this is dangerous?! The bundles are meant to resemble the pyre, or the stake, at which Saint Agatha was to be burned alive (Remember an earthquake stopped the ceremony, and instead they rolled her on hot coals?). The faithful engage in the back-breaking activities to illustrate their devotion and honor Agata’s suffering. Meanwhile, they also help each other and are kind and communicative with each other: To pull the extremely heavy fercolo through the city streets and lift and dance the massive candelabras take teams of people working together. This is what inspired me! There are no barriers, few police, no men on horseback or dogs… just a community working together and celebrating together. This is what I felt with so much awe. On February 5, the procession of the bejeweled reliquary bust of the virgin martyr (pictured here with two devotees) continues, this time with candle wax on the volcanic-stone street surfaces (making movement precarious) and with white flowers decorating the ceremonial carriage (to symbolize purity) versus yesterday’s pink. Then, after the all-night vigil, devotees return the iconic bust to the Duomo, where they symbolically put Sant’Agata to rest. But most importantly, they feel connected to their patroness and to each other in a very deep way.